Editor’s Note: Today we have the privilege of once again publishing an essay by the inimitable Robert Jones, Jr. His last guest post, “Humanity Not Included: DC’s Cyborg and the Mechanization of the Black Body,” would go on to become the most read post in the blog’s history, and become the subject of discussion on a number of other blogs and podcasts. 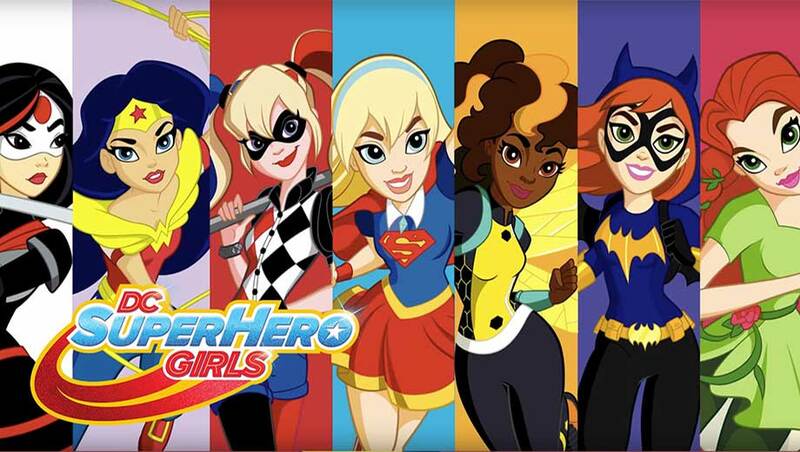 In 2015, DC Comics/Warner Bros. announced the creation of a new franchise, DC Super Hero Girls. It is a teenage take on some of their most popular female superheroes: Wonder Woman, Batgirl, and Supergirl, along with current favorites Harley Quinn and Poison Ivy, as well as lesser-known characters like Bumblebee and Katana to fulfill the token roles for racial minorities. The show’s premise has all of these girls in high school learning to be super heroes at “Super Hero High.” We learn that the seven girls are but a few of the dozens of teenagers learning to become heroes at the high school. There are boy heroes, too (Flash and Beast Boy being the most prominent), but they are not as central to the narrative as the girls, thank goodness, since the target audience is girls ages six to 12, and they need girl heroes with which to identify. The franchise—which includes a website, a catchy, empowering theme song called “Get Your Cape On,” animated webisodes, an hour-long television special (which aired on March 19 on the Boomerang network), online games, and a line of books and merchandise (most of which is available exclusively at Target)—was DC’s response to years of complaints that they not only flagrantly ignored the female segment of their audience when it came to merchandising and programming, but were downright hostile toward girls. DC/Warner Bros were very cautious about this new franchise, however. I could tell by the way they rolled out the campaign, they were hedging their bets, testing the waters. It seemed as though, even after conducting research, they didn’t really believe that young girls would invest in these characters enough to support the media or convince their parents to buy the merchandise. It took six months after the debut of the webisodes for any merchandise associated with the brand to be released. Their seeming skepticism of the brand heightened my own skepticism of them supporting the brand enough to avoid a self-fulfilling prophecy of failure. 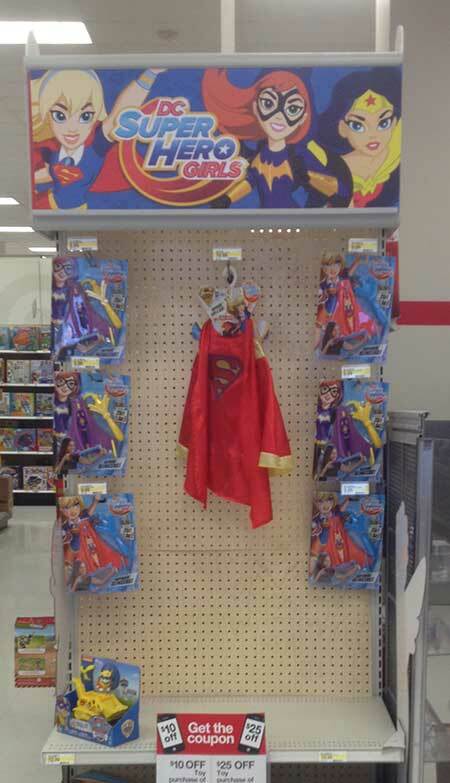 The DC Super Hero Girls merchandise is selling like hot cakes at my local Target. I watched the associated media with great anticipation and, surprisingly, for the most part, enjoyed what I saw. Each of the girls is intelligent, skillful, strong, and clever in their own right, and very supportive of one another (except for Cheetah, a villain who fulfills the role of the obligatory mean girl). These heroes are not girls who need boys to save them. There are, of course, some problematic depictions of girlhood that show up alongside the more powerful ones. For example, jealousy between the super hero girls is one of the unnerving themes, the default conflict between women and girls for writers with limited imaginations. But the writers of DC Superhero Girls manage to correct course by revealing the jealousy to be a misunderstanding resolved through communication. Where the franchise needs serious help, though, is in its racial conversation. The principal of the school is an authoritative, but more polite, take on Amanda Waller (known in the comic books to be a kind of anti-hero with questionable morals). Waller is a black woman charged with the welfare of the teens — you can see where I’m going with this. The white imagination often puts black people in the role of caretaker (Mammy, Uncle Remus, etc. ), particularly of white children, as a means to assure itself that we are harmless and have no intention of avenging its innumerable wrongs against us. 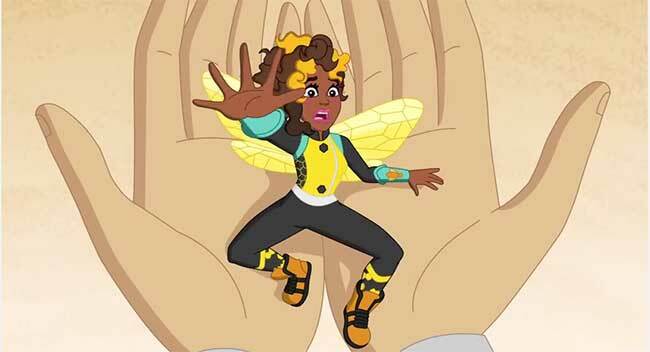 In the first webisode, when Wonder Woman arrives for her freshman first day, it is a black character, Bumblebee, who is assigned to give the princess a tour and ensure that all of her needs are met. We are introduced to Bumblebee after Wonder Woman mistakes her for an insect (one of Bumblebee’s powers is to shrink down to bee size) and smashes her between her hands. Bumblebee screams, “I’m too young to be squished!” in a tone that reminded me of the classic “I don’t know nothin’ ‘bout birthin’ no babies!” from Gone with the Wind, and Wonder Woman, jokingly responds that she didn’t realize the bugs were so big outside of her homeland, Themyscira. In the comic books, Bumblebee is a tech genius and DC Comics’ first black female super hero. Surely, the writers can find a role better suited for her than one which requires her to be subservient to someone who assaulted then insulted her? In another webisode, Bumblebee and Wonder Woman have to complete an obstacle course to test their flying abilities. The android hero Red Tornado is their instructor. Bumblebee aces the test and her instructor gives her zero kudos and ignores her performance completely. But when Wonder Woman steps up to begin her test Red Tornado trips over himself to compliment her ability and commitment to the art form before he’s even had a chance to see what she’s capable of. The webisodes never make clear why this should be the case so whiteness is the default reason for the stark distinction regarding who deserves praise for their efforts. And in the hour-long special, we discover that Principal Waller’s vice principal is Gorilla Grodd — a criminal out on work release who has been forced to become a custodian of teenagers. Yes, you read that correctly. It’s no secret that in the DC Universe, gorillas have long been used as stand-ins for black people, a longstanding and obvious racist trope. In the DCU, the most advanced civilization on the African continent are a race of simians who live in a hidden place called Gorilla City. You can’t make this stuff up — or, apparently, you can. In the special, Grodd is mean and disrespectful to the student body and makes it very clear that he doesn’t want to be there. It’s Waller’s job to keep him in check. Later in the show, Grodd is falsely accused of trying to steal school technology by Granny Goodness, who plays a duplicitous school librarian. The students believe Goodness and alert Waller. Insulted by the accusation, Grodd quits. But not before he gets to put his life on the line saving the life of one of the white girls, Batgirl, thereby redeeming himself. Get your cape on, indeed. Now, there is a lesson in there somewhere about the American history of false accusations perpetrated against black men by white women, but it’s muddied by the dual racism of having a criminal gorilla represent black manhood and having a morally questionable black woman caretaker responsible for keeping him in check. But the morally questionable behavior doesn’t end with the show. I bought each and every doll from the line. Well, I should say: I bought each and every doll that was available. Because although she’s featured prominently in the marketing of the brand, Katana can only be found as a background character in the series and will appear in a chapter in an upcoming book. There is no Katana action figure. There is no Katana doll. As the only Japanese character, she is featured prominently on the website alongside the six other heroes, but she is missing from almost all of the commercially available items (I should mention that the franchise doesn’t feature any Latinx or Indigenous characters either). I don’t know if DC/Warner Bros left her out because of some trademark or copyright issue or what, but her absence is conspicuous and DC/Warner Bros is suspect because of it. This racial disparity is compounded by the mini-biographies on the back of the doll packaging. In the category of “Best Super Friends” each character is assigned a best friend. Wonder Woman’s best friends are Batgirl and Supergirl; Batgirl’s best friends are Supergirl and Wonder Woman; Supergirl’s best friends are Batgirl and Wonder Woman; Harley Quinn’s best friend is Poison Ivy; Poison Ivy’s best friend is Harley Quinn; Bumblebee’s best friends are Supergirl and Batgirl. Not one of the other girls claim Bumblebee as a best friend. This could merely be an oversight, but even oversights tell us something about the pathologies at work. And it’s clear to me that there’s a racist pathology at work here, one that’s easily solvable — if the goal is to actually solve it: white men and white women should never be the majority in any creative space. There should always be just as many women and men of color in these spaces, not only because the more diverse a space is, the more creative it is, but also because media is a form of propaganda and the only way we can begin to stop spreading “well-intentioned” (or maybe not-so-well-intentioned) but harmful messages about marginalized people is to put marginalized people in positions to prevent those messages from being disseminated. Diversity is just a buzzword designed to make white people of relative consciousness feel good about including a token or two in their normally exclusively white spaces. Too often, to white people, diversity and tokenism mean the exact same thing and they go into full-on white fragility mode if you dare question their racial practices. They never seem to realize that their defensiveness and attempts to dismiss criticism can be read as admissions of wrongdoing. The true test of conscience for the white person is measured by how willing they are to no longer be the central, definitive, default perspective. In the meantime, we work with what we have, educate our children so that these subtle and not-so-subtle messages have less of an impact on them than they did on us. Or we choose to remove our children from the sight lines altogether and invest our considerable consumer power elsewhere. The precise location of “elsewhere,” however, remains the eternal question. 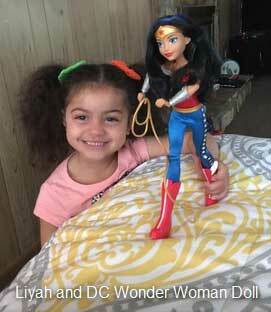 The main characters of DC Super Hero Girls. From left to right: Katana, Wonder Woman, Harley Quinn, Supergirl, Bumblebee, Batgirl, and Poison Ivy. Robert Jones, Jr. is a writer from Brooklyn, NY. His work has been featured in the New York Times, Gawker, and the Feminist Wire. He is the creator of the social media community, Son of Baldwin, which can be found on Facebook, Google Plus, Instagram, Tumblr, and Twitter. ← If It WAUGHs Like a Duck #11: Darned to Heck! Interesting read. I’ve seen the first “season” of this show (the episodes are all 2-3 min each), so I hadda rewatch the Red Tornado one. That was almost hilarious how he’s so excited about WW that he does indeed completely ignore a flawless performance by Bumblebee. But I don’t think that was intended to be a joke. I definitely agree with a number of the point made, specifically in terms of the merchandise. Also more WOC should be included, such as Artemis, Aquagirl, Rocket and Cassandra Cain. I don’t personally think the Waller thing registers as all that bad. You point out a connection to the “mammy” stereotype, but I think kids will simply see an authority figure. I’ve not witnessed instances where Waller’s been portrayed badly in that way. I also see the point of the Grodd thing, but IDK if it comes across all that awful to me personally but in fairness I’ve not watched it myself. I have to say, great post! As an avid reader of comic book books and comic book universes, I agree with you that there is something odd going on with the DCU and this is from way back. I was just talking to my sister the other day who has begun to develop an interest in comics and she noted on her own mind you, that DC has little or no diversity–and where there is (diversity) they often are stereotypical forms of their respective races/ethnicities. Marvel has done better and for that I feel that they deserve an applause. They are among the most diverse as far as characters are concerned from Spiderman (whose design Stan Lee had commented was supposed to mask his race/ethnicity) to Storm as a leader, even down to Kamala Khan (the new Ms. Marvel). So, keep it up! I haven’t seen the special yet, but I’m even more interested after reading your interpretation. DC and Mattel are hardly at the forefront when it comes to diversity in children’s entertainment, but I’m hoping they realize the opportunity they have and quickly come to their senses and take it. This came up in one of the comments above. I can’t speak for Robert, who wrote this, but I don’t think being a con exclusive is as “special,” as having her readily available for kids who want to play with Asian female superhero character, or for parents who want to buy them for their kids. A very interesting and probably correct interpretation of the intentional and unintentional racial biases that happen when creative teams almost certainly composed of exclusively white people attempt to depict minorities. This article doesn’t come across as nit-picking the way some feminisit criticisms can, in that the writer doesn’t agree with a certain interpretation and wishes it to be different. For example, depicting a female character as a mother isn’t wrong any more so than depicting her as a single-minded career woman. It’s not wrong to portray a single-minded career woman who longs to have a child either. The problem comes from inadequate representation. Female characters are often tokens and thus must necessarily represent all female points of view simultaneously and that’s just not possible. In my opinion, this article isn’t quite like that. The representation is clearly problematic albeit probably unintentional. To be frank, I’d not thought of the metamessage about Gorilla City and I’m a bit embarrassed for that. But I disagree somewhat with the depiction of Amada Waller as a “Mammy” character. It’s certainly legitimate to see if that way, but I do feel that it is a stretch to argue that black women in positions of legitimate, systemtic, authority are Mammy characters. The author is onto something with Bumblebee, though. I noticed that none of the white girls were best friends with her. And I noticed the way Red Tornado just expected Bumblebee to be athletically superior, a “positive” but still problematic stereotype. And I was puzzled by his false or faint praise of Wonder Woman (who isn’t yet anyone of note). It could well have been racial but it’s possible that as Wonder Woman is technically royalty, he was erring on the side of being respectful to that heritage. But I’m sure that white people like myself have a never ending list of excuses or explanations for unintentional racism. Be that as it may, there is absolutely no excuse for the lack of a Katana figure. She is being offered as a San Diego Comic Con exclusive but that shouldn’t count (and it’s been months since the other girls were available). Asians have seemingly been the most economically disposable when it comes to casting and utility in North American narratives and media. They are fewer in number in the United States and to a large extent are thought to be more invisible or “non-threatening” than Blacks. This is made obvious by their overall lack of representation in American media as a whole and how often their roles are “white-washed” for white actors. This happens significantly less often with roles meant for Black people. There is enough social pressure for DC to recognize the potential for bad publicity were they to ignore having a Black character. So Bumblebee was included probably from the start of the project whereas I’d guess that Katana was an afterthought. The writer and I both noticed the lack of a Latinx or Hispanic doll or primary character. The lack of this representation is extra obnoxious considering the large number of people from Latinx or Hispanic origin in the United States. I suppose one might suggest that Cheeta comes across as Lantinx or Hispanic but it doesn’t seem definitive. And is there any LGBT representation at all? What? You say. “They are just kids, there’s no sexuality there. Just let kids be kids,” say the people with no clue and who ought to know better. These are high-school girls and even in middle-age, I can remember what being in HS was like and as early late elementary school, I was struggling with my gender and sexual identity. Just because it’s uncomfortable to talk about (though why should it be?) doesn’t mean it’s not worth talking about. So no, this show is NOT perfect and that’s an impossible standard to have. However, there are some problems that could have been fixed and could still be fixed. I’m not going to let the perfect be the enemy of the good. But I will not begruge someone who feels that the people they identify with are not being represented fairly. Then again, there a plethora of angry (mostly white) males out there upset with this show for wounding their fragile male egos. Fortunately for them, they have every other superhero series ever made to wrap around themselves while they weep bitter tears that one thing did not go their way or cater directly to them. I don’t think it’s totally fair to dismiss all male objections to this as ‘wounded egos’ or whatever. It’s fairly legitimate, I think, to point out that making Poison Ivy and Harley Quinn into role models for young girls is a terrible, terrible idea, given what they’re going to find when they venture outside the DC Superhero Girls universe. Poison Ivy is an insane ecoterrorist who kills people by kissing them, and Harley Quinn is an insane battered spouse in an abusive relationship with the Joker in every other setting where they exist. That all carries its own problems, of course, but completely ignoring the source material and making them into quirky superheroes for little girls to look up to seems like it’s swinging a bit too hard in the other direction. Harley has an aesthetic that a lot of people really like, but I’d be concerned about encouraging young girls to relate to her when she’s defined by an abusive relationship in all other media. They could have included Hawkgirl in the main group instead– especially since she appears to be latina in DC Superhero Girls. Blech. I was hoping for something more inspiring. I was disappointed that Vixen is not one of the main characters and only just appears in just one episode. If I were a character on the show Bumblebee can be my best friend !